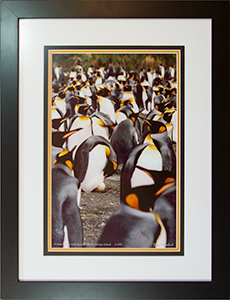 King penguins are the second largest penguin behind only Emperor penguins, to which the appearance of the adults is very similar, but their ranges do not overlap (King penguins preferring subantarctic islands like South Georgia where they gather in colonies in the hundreds of thousands). 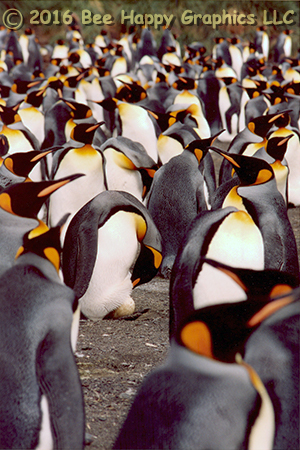 King penguins (in the same fashion as the Emperors) do not make a nest, but keep the eggs resting on their feet. The parents take 6-18 day shifts incubating the egg until it hatches in about eight weeks. They have the longest breeding cycle of any bird, taking around 15 months to fledge a single chick. 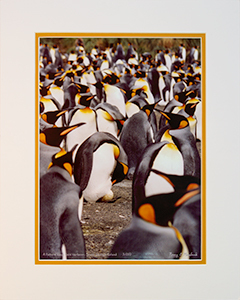 The chicks have long brown down resembling a fur coat (completely different than Emperor penguin chicks), which inspired whalers to name them “oakum boys”. The oakum boys are very inquisitive; at this site one of them tugged at Nancy's glove while she was taking photographs. Photographic details: Nikon F3 35mm SLR with a Tokina AT-X 100-500mm f/5.6 telephoto lens using Kodak slide film. Scanned with Pacific Image Electronics PrimeFilm XE scanner. Fine Art Paper 17" x 11" 40" x 27"
Canvas N/A 53" x 36"